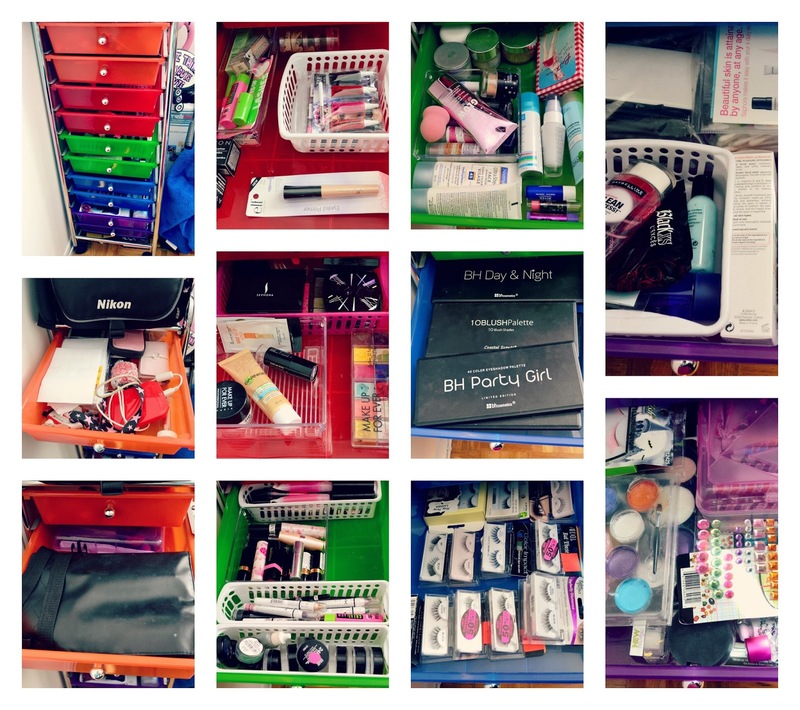 CarolinaCupcake Makeup: My Makeup Storage! I wouldn't consider myself to be the most organized person in the world. In fact, I would say it's the exact opposite. Even though I try and stay organized, it never stays that way. It's absolutely frustrating! I've been watching a few beauty guru's on YouTube and every so often one would come out with a 'how I store my makeup" video. All super organized and beautiful! I wanted my makeup room to look like that and it didn't...far from it. After watching one too many of those, I looked at my room, cried a bit and got to work. Literally HOURS of organizing, throwing away and figuring out where the hell things were going to go and on a super small budget. I ventured off to the dollar store and bought $30.00 worth of plastic containers and organizers and finally got everything under control! This is how my makeup desk looks like! I got the desk back in high school (so it's pretty old) I got the little 3 container boxes from the dollar store and the larger 'tree' from target recently. This is where I store the makeup and hair products I frequently use. Here is a more in depth look at what's inside my makeup containers! 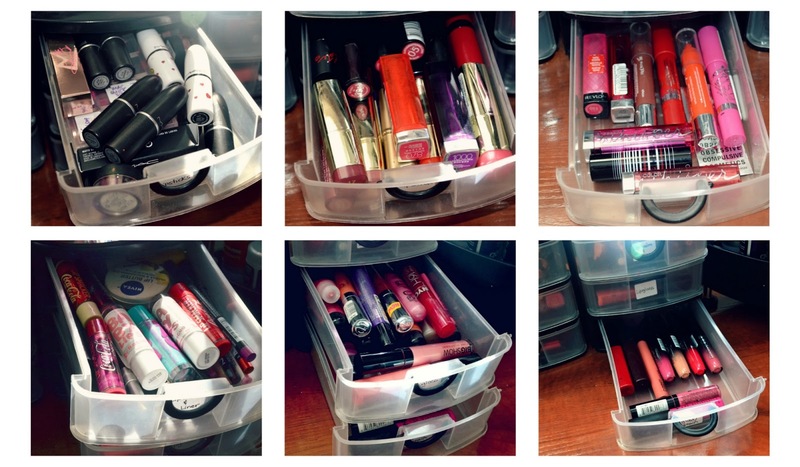 Bottom Row: Lip balms and lip liners, lip glosses and liquid lipsticks. This is the inside of my desk is where I store all my powders, highlighters and blushes. My eyeshadow palettes, hair brushes and a little bin of falsies! This 10 piece drawer set was purchased at Michael's craft store. I store all the makeup I don't use on an everyday bases. First row from left: The drawer set, first drawer has all my electronic devices (usb, camera charger, digital camera, cases and etc). Second drawer has my makeup brushes I need to clean for freelancing! Second Row: Unopened makeup (like mascara's, eye primers and lip products. Second drawer has some eyeshadow palettes, foundations, powders and my Make Up For Ever flash palette. Third Row: Skin care products like creams, SPFs, lip balms and powders. Second one has all my eyeshadow palettes from BH Cosmetics and Coastal Scents. Third drawer has all my unopened false eyelashes I will use for jobs. Fourth Row: facial cleaning products like wipes, makeup remover and samples and the last drawer has face painting paints, sparkles and etc for more fantasy looks or children's parties! I also have another storage unit in my room and I have hair products, some other eye shadows, my theater and special effects makeup and all the other random makeup bits one can needs such as spongers, wipes, cottom swabs and other necessary products to maintain a clean and sanitary makeup practice!